Aircraft Spruce & Specialty Co. has acquired all existing inventory, tooling, and drawings for the prefabricated metal parts used in construction of the popular Cozy Mark IV aircraft. Ken Brock Manufacturing Co. of Stanton, CA produced the metal parts for the construction of the Cozy and Long-EZ aircraft since the mid-1970's until ceasing business operations on December 31, 2005. As the owner of the design rights for the Cozy Mark IV and the source for plans and kits, Aircraft Spruce wanted to insure that builders would continue to have a source for the former Brock parts, and now has the existing inventory in stock. There was no remaining inventory of some of the parts, but these parts will be available as soon as new production sources are established. Builders are also encouraged to join forums, as experienced builders can provide a wealth of valuable advice on construction of this wonderful aircraft. 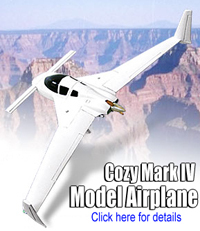 Aircraft Spruce purchased the Cozy designs (Cozy III and Cozy Mark IV) from Co-Z Development, and as of January 1, 2004 has the exclusive right to market these designs. These designs are protected with U.S. copyrights, and Aircraft Spruce has licensed no one else to copy all or any part of these designs to sell, loan, or give to others.